The Black Cat Quilt Shop in Holden, MA was having a fabulous sale this past Saturday and I was in need of some Christmas fabric for an order of hand embroidered Christmas stockings. Being the frugal person I am, I thought it would be a good idea to see if I could get some yardage of Christmas fabric on sale. So off I went. I found this gorgeous Christmas yardage that will make a bunch of wonderful stockings for a wonderful family. And those two boxes from Moda Bake Shop each have thirteen cuts of fabric measuring 4 1/2 inches by WOF, along with a pattern sheet. They were on sale too! You might recognize that front box as holding cuts of the same Adoring fabric by Sandy Gervais that I used in my Christmas Tree Advent Calendar recently. 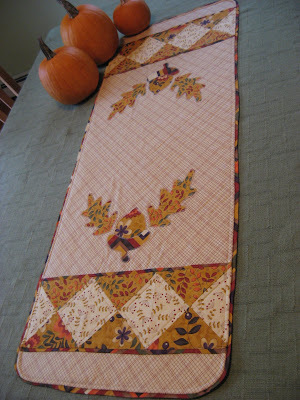 This quilt kit was 70% off and included the pattern and all the fabric for top and binding. It looks like a good project where I can practice my triangles! Deb Strain's Saltbox Harvest jelly roll was on sale 70% off as well as this quilt kit which included the basket with labels, the pattern and all the fabrics for her Saltbox Harvest quilt. The little dark blue label says "Wash me with mild detergent and don't agitate me." I'd like to put it on myself some days! And here's the cheerful Christmas fabric I got for that stocking order. I just love the colors and all the pretty packages with tags! So I made the drive to this cute little quilt shop after finding out that their Christmas fabric was going to be marked down 70%, and thinking I could walk out with only Christmas fabric. I don't know what I was thinking! Actually I had no idea that all their fall fabric, kits and precuts were also marked down the same 70%! I just could not resist! So for about what I would have paid for the Christmas yardage alone at regular price, I came home with all this fun fabric to keep me busy into the next decade! And I was doing so well using up my stash. What great finds. Now you should be all ready for next Christmas. And I think we all need a "don't agitate me" sign. Well I think you struck gold! Quite a shopping trip, looks like you had a lot of fun. I would like one of those labels, also. oh my, you did great and found some fabulous items! don't you just luv shopping trips like that...it's like you hit the lottery!! Jelly Rolls ~ I won again! 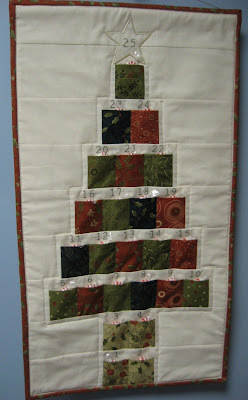 Log Cabin Quilt Top ~ I think it's time! I Spy Quilts ~ Finally Finished!